This photo post is inspired by a sentence that a fellow blogger used in one of her posts. I have read a photo post of Taswegian where she said that she saw lots of construction going on in one of the streets she walked through. I commented there that we have a lot of construction in our city Lübeck right now too. Then I remembered that I might even have a photo and found one in my photo folders. You see the photo in this post. 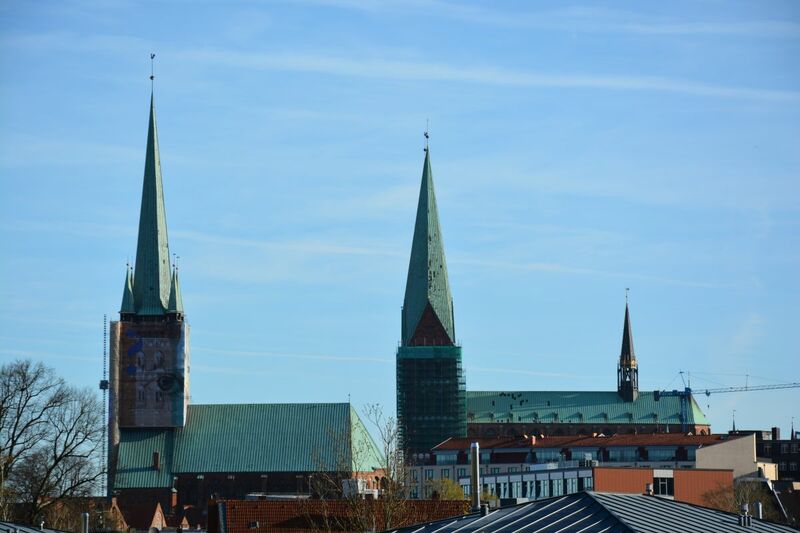 On the left side of the photo you see the St. Petri Church and on the right side you see the St. Mary’s Church of Lübeck. Both are now under refurbishment. It’s dramatic because I think most tourists that visit our city do it because of the old architecture. Sure we also have to offer other things like nice beaches outside of Lübeck and so on. But if some people would come here for the architecture, there are several buildings shrouded right now. I don’t think that the texture in front of the scaffolding improves the view. Anyway, I do understand that the architecture needs to be kept intact. But for tourists it’s probably sad. Every year we have different buildings under refurbishment, they don’t refurbish all at once, but I think it’s a never-ending job because the buildings are pretty old. It’s good that the churches are refurbished when they need it but as you say a bit disappointing for tourists. i remember that a couple of buildings that I was looking forward to photographing were being refurbished when we were overseas. One was York Minster in England. We were still able to visit inside but I had to be creative to photograph the outside while minimising the view of scaffolding. Living so far away it is disappointing when you know you may never go back to try again but that’s life I guess. True, it’s sad if you travel there to see some culture like architecture. It’s some years ago when they refurbished a more exciting landmark in our city, the Holsten Gate, and then I saw a group of asian (probably Japanese) tourists looking disappointed at the scaffolding. But yea, if these buildings wouldn’t be refurbished they wouldn’t amaze other people in the future, that means it has to be done everywhere. I had to ask Google for York Minster, that cathedral looks very amazing! Did you upload the photos you could take? It probably is really disappointing for tourists. But it makes me happy to see old buildings being restored. Here, it seems like most older buildings just get torn down to make room for new ones. Of course, I wouldn’t be so happy to see scaffolding if I had travelled a long way to photograph the place!